A boomerang, or just an epic fail. How else could it be called? This what became the recent advertising campaign launched on 18 Italian newspapers by Philip Morris Italia. 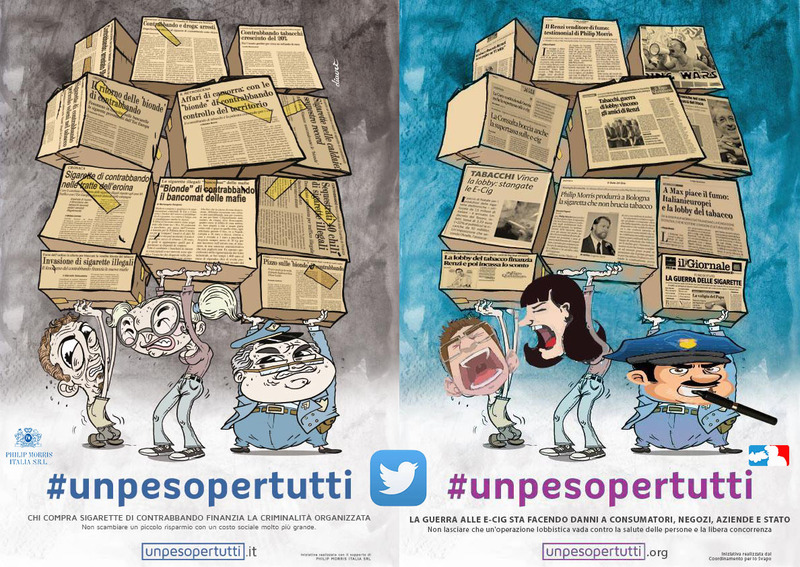 The reason of the ads is a social message against tobacco smuggling, using the payoff #unpesopertutti (#aweightforall), referring to the weight on the citizens deriving from the organized crime activities. There is also a light website, www.unpesopertutti.it, with news and not that much more. A campaign “with the support of Philip Morris”,as written on the poster used, which is a aìway also tu legally circumvent tobacco advertising ban (while setting up a good relationship with the media…). A poster that presents a guy and a girl together with a policeman, almost ovewhelmed by the weight of boxes with on them press clips referring to tobacco smuggling. Then, yesterday, a counter Twitter campaign started from the e-cigarettes world: vapers, store owners, antismoking groups, consumers, all united in using PMI’s same hashtag #unpesopertutti, but against the multinational company. The “Vaping Committee”, the name under the vaping world is twitting, set up a ghost website called www.unpesopertutti.org, which sends to a full amount of info about iQOS, the heated tobacco product launched by PMI in Italy in 2014 (which obtained a favourable fiscal regime, paying just 50% of the excise). A product with several issues, with recent talks of presence of combustion, plus the fact that it can be smoked (as for the video published). Plus, the Committee redesigned PMI’s poster, with a new the boxes filled of articles referring to Philip Morris’ lobbying, and a new payoff: “The war to e-cigs is damaging consumers, store owners, companies andì the Government. Don’t let lobbying work against health and competition“. All this is happening because, as read on several newspaper and even in parliamentary discussion, it seems like that PMI, with its 1bn investment on the IQOS factory in Bologna plus the purchasing of Italian tobacco, could be behind most of the Government choices in terms of taxes against e-cigarettes. Choices stuck down once by the Constitutional Court, which will make another decision in 2016, highlighting the failure of a war to health. Results of the twitter storm? Thousands of tweets against PMI and its campaign, involving politicians, officers, journalists and influencers of all kind. All using PMI’s hashtag, which in the meantime gets advertised on the most important newspaper of the country. Next monday, somebody in Italy will get an headache when at PMI’s HQ in Lausanne they will see how their advertising money get spent. And, at least this time, David won against Goliath. Tag: #unpesopertutti, e-cigarettes, ecig, ecigs, epic fail, heat and burn, heat not burn, heated, iqos, philip morris, social media, tobacco. Aggiungi il permalink ai segnalibri.